Yuuri appears only in flashbacks, having died before the beginning of the series. Her first appearance is in a single panel in Chapter 4 before appearing in an extended sequence in Chapter 5. The Yuuri seen in other chapters of Kazumi Magica is in fact her friend Airi, who has taken her appearance and identity. 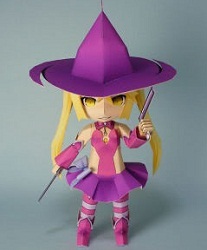 Despite being deceased at the beginning of the series, she is important to Kazumi Magica’s story. A magical girl, her wish was to cure the life-threatening illness of her friend Airi. This entry was posted in Anime Girls on 17/12/2014 by ToyXD.